Can we get back to (Kalamazoo)? If you’ve seen Hamilton, sing that as Thomas Jefferson at the beginning of The Election of 1800. After two weeks on the road, it’s time to get back to some Kalamazoo area blog posts. I got home from D.C. around 7:00 on Monday night after driving all day. I had quite a bit of overtime and I had been gone for so long, my boss told me to take a couple of days off. L was doing a theater camp again this year for Spring Break and since I was home, I told J I would pick her up as well as getting B from daycare. J gets home from work a little after 5:00 now. 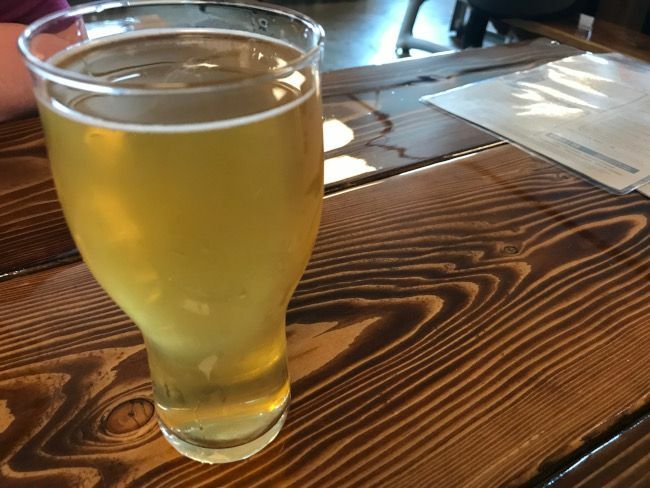 She didn’t feel like making dinner and I didn’t either…plus, she wanted to take me to a new brewery she and the kids went to with friends while I was traveling. 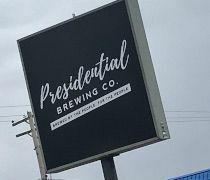 Presidential Brewing Company is yet another new brewery in the Kalamazoo metro area. It’s on Portage Road south of Centre Street. It’s actually in the building that used to be Lazer Land. The mini-golf course is still there but not being used at the moment. I guess they may try to rehab that and have some fun with it in the future. We got to Presidential just before 6:00 on a Tuesday night a week after they opened. The parking lot was full. J told me not to freak because the restaurant is pretty large and there are a lot of tables. The seating is done at highly polished dark wooden picnic tables. There are a few spots with tables and chairs but for the most part, it’s shared picnic tables. There’s a pretty good sized bar right as you walk in the door. It’s nothing fancy but it gets the job done. And the thing that will make this a regular stop for us…..there’s a kid’s play area. 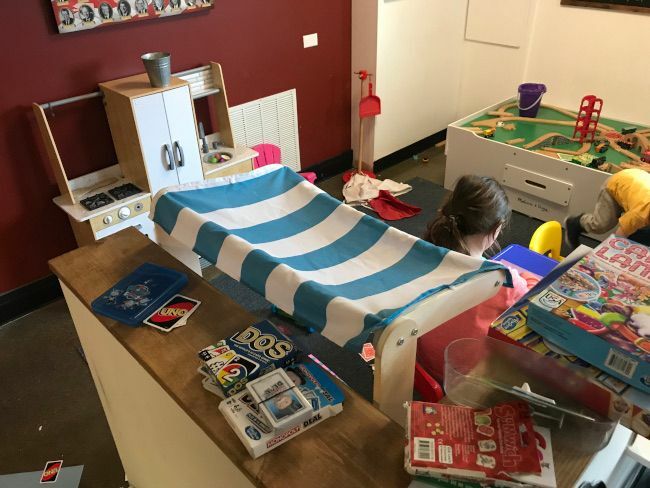 There are games, toys, a chalkboard…so many things for the kids to do. Both L and B played pretty well with a couple of smaller kids who were playing restaurant when we showed up before moving over to the large chalkboard. There’s plenty of seating near the play area as well so we could see them the whole time. The beer menu is on the table in the form of one of those little plastic stand things. Unfortunately, or I guess fortunately actually, this place was really popular on opening weekend and they didn’t have a lot left. Keeping with the theme, all of the beers have patriotic names. 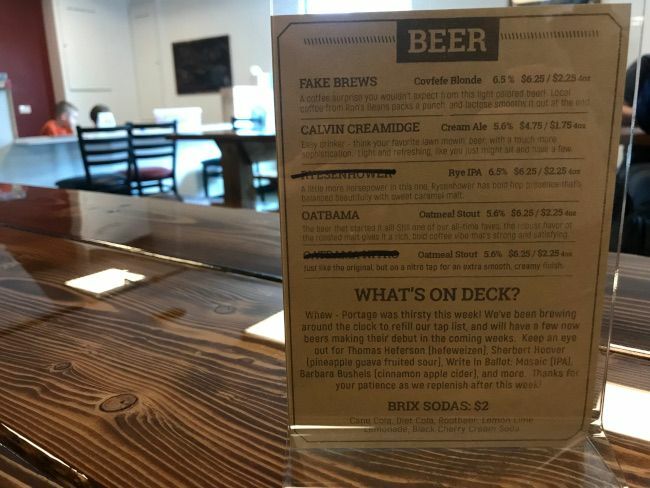 I started with the Fake Brews because they actually call it a “covfefe blonde” instead of a coffee blonde. I mean….that’s just funny. The beer was good. I’m not a huge fan of this style because I don’t really like coffee and that is definitely a dominate flavor. Still…a good beer especially if you like that kind of thing. The second one I tried is kind of their flagship. 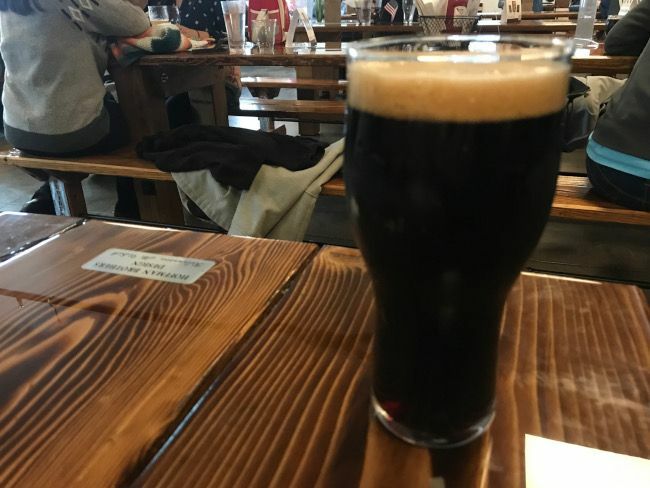 It’s called Oatbama and it’s an Oatmeal stout. Again, not a huge fan of this style of beer…but this was really good. I could sip on one of these all day. There were no ciders on the menu so I told J to order the Calvin Creamidge. As the name implies, it’s a Cream Ale which she seemed to really like even though she’s not much of a beer drinker. 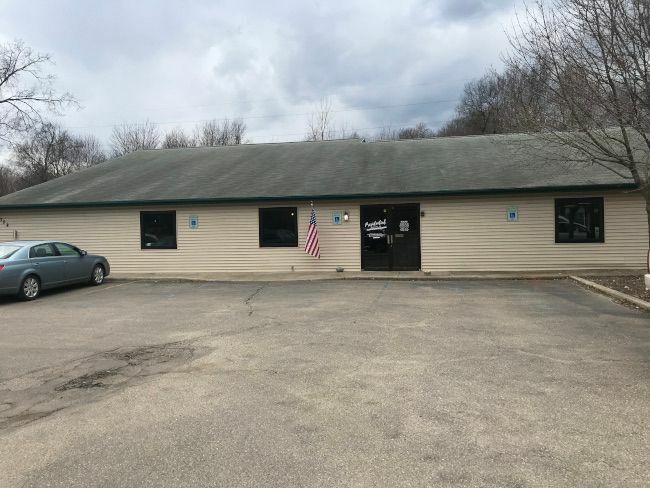 I know she really likes this place and it’s close to some friends of hers so hoping they get some ciders or something on tap real soon. I was pretty impressed with the food menu when I first saw it. I never have very high food expectations when breweries first open. Most places seem to be in a hurry to get the beer done and the food comes later. That was not the case with Presidential. 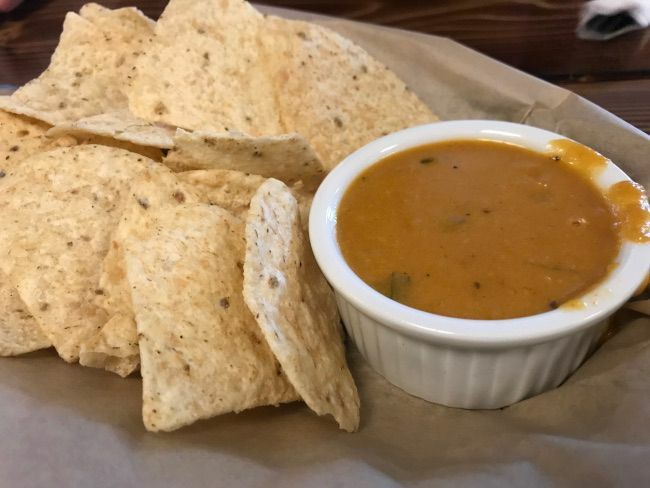 We started off with some beer cheese dip and tortilla chips. It appears the dip is made with a dark beer which gave it a little bit of bitterness. J loved it so I let her and the kids have most of the chips. I didn’t have a problem with I just didn’t like it as much as she did so I let her go to town. I ordered the Porker Burger which combines two of my favorite things. Pulled pork and a hamuburger. The sandwich is a massive mess which also includes beer cheese, bacon and a house BBQ sauce. 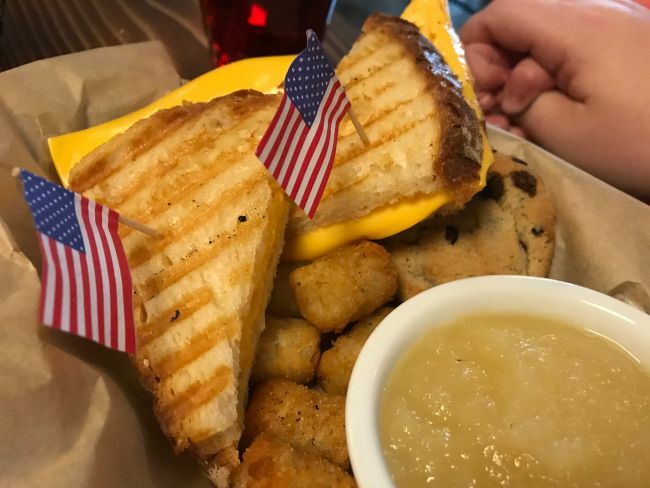 All of the sandwiches come with little American flags stuck into the top of them, chips, and a pickle spear. The sandwich was fantastic. 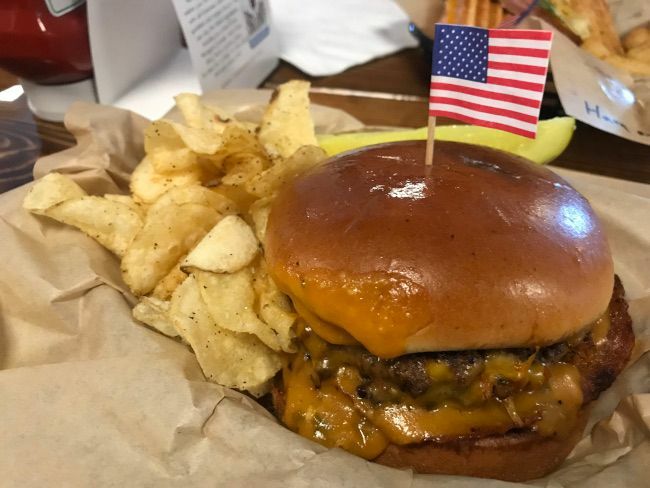 The hamburger itself was super flavorful and juicy…then you add in the tanginess from the BBQ sauce and the house made pork. I said just a paragraph ago I have low expectations at breweries when they first open…this burger would have met high expectations if I had had them. J ordered the Ham and Cheese Panini. The pressed sandwich also includes lettuce, tomato, a garlic aioli, and beer mustard. Her sandwich was a pretty classic panini pressed as thing as the toppings would let them go. She picked tots as her side instead of the chips but she never really said much to me about them. I don’t really like tots so I depend on others opinions with the funny shaped potatoes. 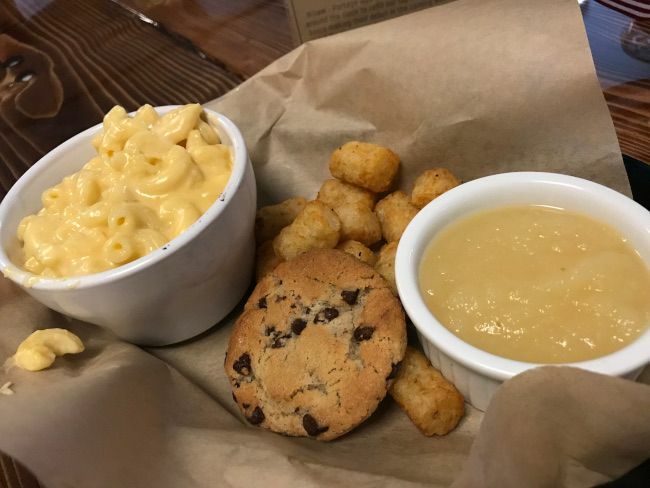 The kids menu has five choices and comes with a pop, tots, chips, and applesauce. L stuck to Mac & Cheese and did her thing of only eating about five bites. The dish is large macaroni noodles in a very creamy sauce. I ended up eating about half of her bowl so it didn’t go to waste..and it’s not a huge portion size. She doesn’t eat because she likes to fight us…not because it doesn’t taste good…because this mac & cheese was delicious. 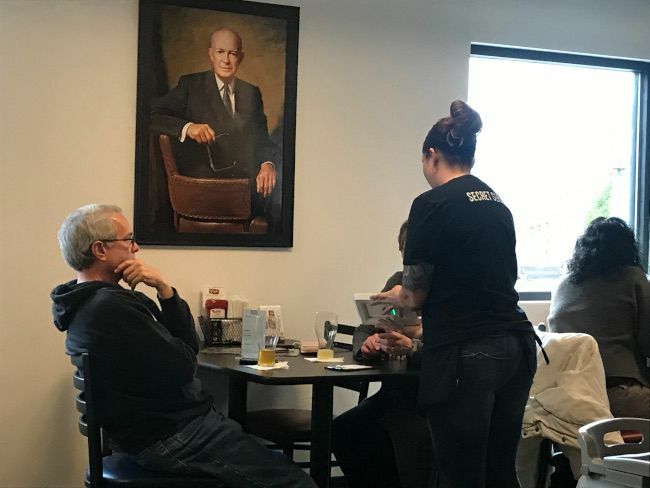 We initially ordered B the mac & cheese as well but he spoke up as the waitress was writing down and told her he wanted a grilled cheese instead. 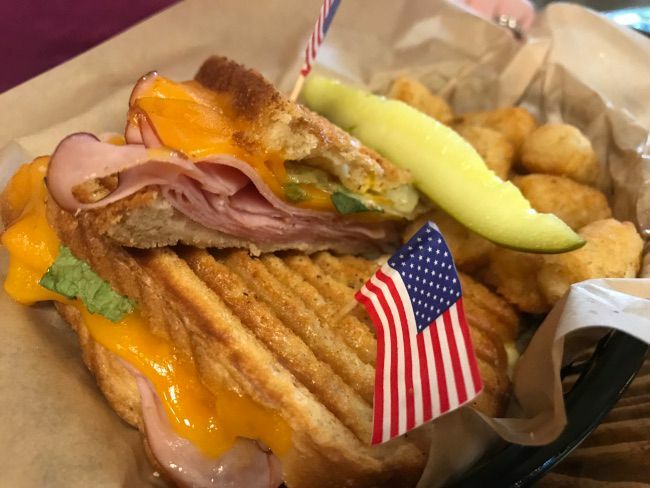 His sandwich is pressed on the panini press as well and has that delicious, gooey, cheesy center sticking out from between the two slices of bread. He did better than his sister when it came to eating but he was in a hurry to get back to the play area and only ate about half of the sandwich, a few tots, and, of course, the cookie. So, that was the end of dinner. It costs us just under $65 before tip. I need to point out one other cool feature of Presidential before wrapping this up. 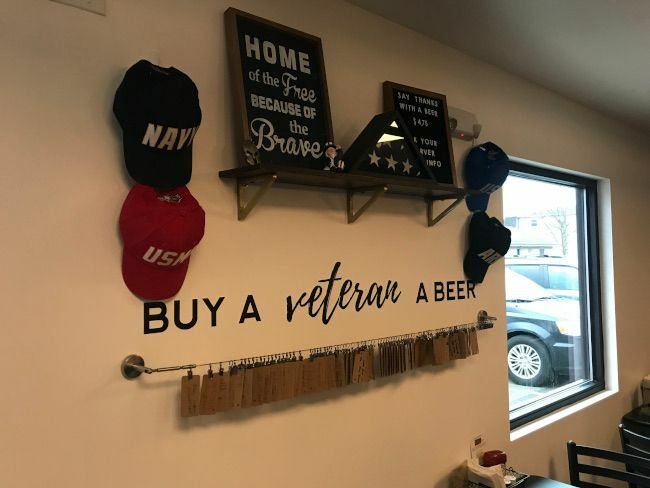 They have a program where you can purchase a beer for $4.75, write a note on a piece of paper that looks like a dog tag, then hang it on the wall for a Veteran. Any veteran can then grab a tag and get a free beer. WOOD-TV did a story on it last week that explains it a little better but I noticed when we were walking out, the line is full….they need some vets to come in a drink one that’s already paid for. Presidential Brewing Company has everything we like in a brewery. 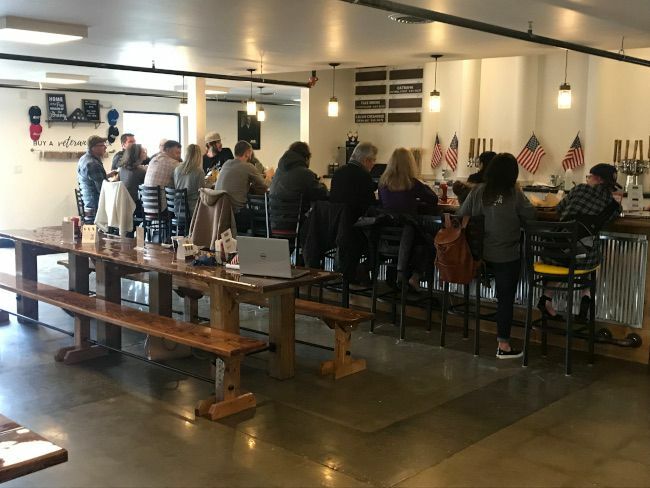 It has great beer, delicious food, and it’s very family friendly. I was planning on giving it a few weeks before heading to Portage to check it out but J was right there opening weekend with some of her friends and couldn’t wait to bring me back. 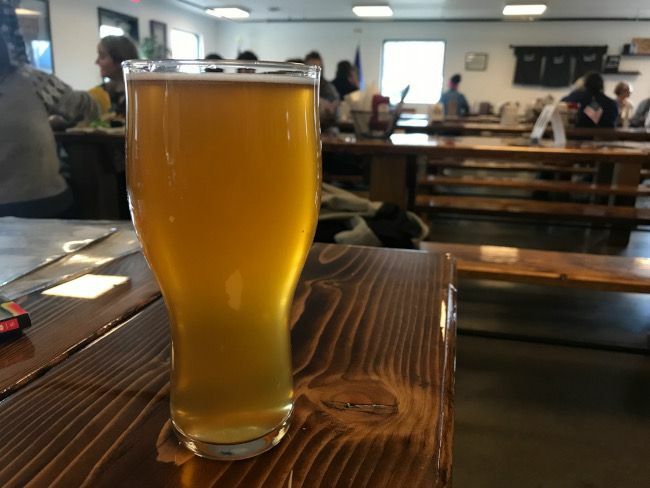 We spend a lot of time at One Well Brewing because of their large play area and always enjoy trips to other Latitude 42 location. 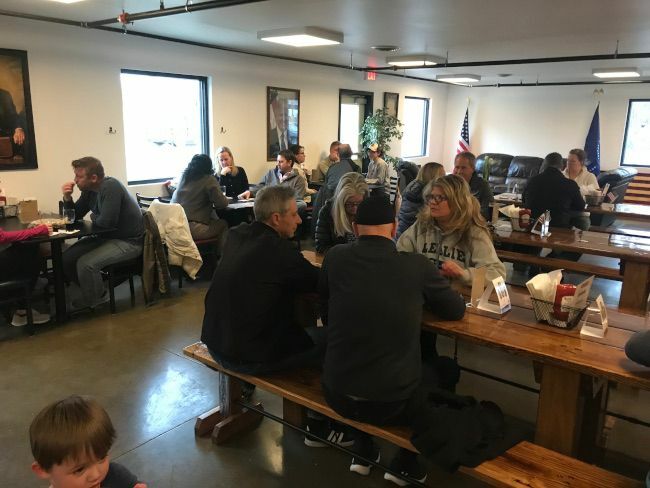 Presidential Brewing will definitely make it in to the rotation when it comes to meeting other families for a beer.